In 1932, George Roth won the gold medal in India Club Swinging. I had no idea what that was, but if my imagination were allowed to run wild, my first thought would not have been sport. 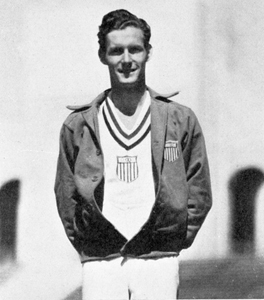 Roth, who won his gold medal at the Los Angeles Olympics in 1932, and was so poor he could not afford to travel to across the city to get to the LA Coliseum and receive his gold medal in the award ceremony. He had to hitch a ride three times, and I suppose at that time, only the wealthy had cars, because of his impromptu taxi drivers was the famed entertainer, Jimmy Durante. Indian Club swinging in 1932 was experiencing its death throes as a competitive sport. Popular really only in North America, Indian Clubs had its last major competition in 1953. Today, a few health gurus market Indian Clubs as an excellent way to build lung capacity, strengthen shoulder joints, and build general upper body strength. Indian clubs look a little like bowling pins, but they are skinny and have long necks with a small, round knob at the top end. What you do is twirl them around your body – in front, in back, and on the sides – without letting them touch each other or yourself. The routines lasted for four minutes, and you couldn’t stop or hesitate or repeat any pattern that you already had done. Below is a video showing the basic movements for Indian Club swinging. So why do we call this sport, Indian Club Swinging? Back in the day, when the sun never set on the British Empire, and the Kings and Queens of England were the rulers of India. Europe, particularly London, was experiencing the nastiest effects of the Industrial Revolution – overcrowded, polluted, disease-ridden cities. At the same time, men of science (primarily men at the time) were showing the world that we were masters of our destinies, and could reclaim and enhance our health through modern medicine or regimented exercise routines. One of the things the Brits found more than just charming in their Indian colony was the routine of swinging clubs. They could see how easy it looked, but how much of a workout it actually provided. Indian club swinging eventually became a training routine for military cadets. British women found this accessible, and thus a lady-like way to stay in shape. And as you can in the video below, Indians today take their club swinging seriously. Now let’s address the name, Indian Clubs, confusing for the same reasons Americans traditionally used the moniker “Indians” for Native Americans. Thanks to the Brits, we associate this activity with India. But earlier usage of clubs can be traced to the Middle East, Persia to be exact. Way before the British Empire covered the map, wrestlers throughout the Middle East used these clubs, or meel, as they are called in Persian. When the Mughals, a Muslim set of clans, migrated to Northern India (Uttar Pradesh and Delhi), wrestlers in India also took up the practice of swinging meel. When I wrote this piece on super star wrestler, Gholamreza Takhti of Iran, who is often pictured holding these huge clubs. Now I know the rest of the story. Posted in Gymnastics, Other Olympics, Others, Wrestling and tagged 1932 Los Angeles Olympics, British Empire, George Roth, Gholamreza Takhti, Indian Clubs, Industrial Revolution, meel, Middle East, Mughals, Persia, Victorian Age. Bookmark the permalink. Interesting article! The 1932 event was the second time the clubs made an Olympic appearance, having first appeared at the poorly attended 1904 games. Interesting both times it was America who hosted, and seemingly promoted, the events.